The survey and the results are based on the Reputation&Trust survey, carried out in June and July 2018 with the goal of investigating the reputation of companies operating in Finland among the general public. A total of 6612 Finns responded to the survey providing a total of 17,004 company evaluations. Ponsse was evaluated to be excellent in all eight dimensions of reputation that were measured in the survey. In addition to the total score, the company was assessed to be historically good in responsibility and the ability to renew itself. According to Riku Ruokolahti, T-Media’s Development Director, the set of indicators used in the Reputation&Trust survey is challenging due to its varied nature, and success in one dimension is not enough to reach the top. “In order to increase trust, product and service evaluations must be supplemented by collecting positive views especially on openness, transparency, acting as an employer and appropriate overall business behaviour. “Ponsse is an example of a company that has been successful in all dimensions and remained at the top of the industry’s development. The company is committed to developing the well-being of its employees and the whole surrounding community. Ponsse has also taken care of dialogue and interaction in a comprehensive way – not just by successfully selecting sponsorships,” Mr Ruokolahti said. 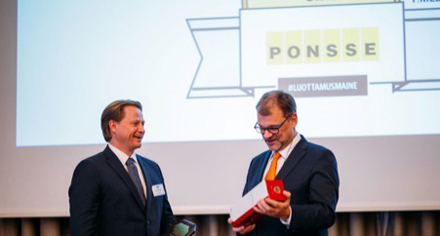 Juha Vidgrén, Chairman of the Board of Ponsse, received the Reputation&Trust award in Helsinki which was presented by Prime Minister Juha Sipilä. According to Juha Vidgrén’s assessment, the success was based on the ability to manage challenging situations. “Ponsse has come a long way since the depression of the early 1970s, when the first PONSSE forest machine was completed in Vieremä. At that time, there was no capital, no engineering skills, no machine-building study, not even the company’s own factory hall. “Our success of today is based on winning the challenges of the early days. These starting points still serve as the foundation for the determined management of customers, persistence, tolerance for uncertainty, appreciation for work and the expertise of personnel, and flexibility. “The brightest goal has always been to manufacture the best forest machines in the world. As Einari Vidgrén, the company’s founder, put it: the Mercedes-Benz of logging sites,” Juha Vidgrén said. “In the tightening competition for skilled workforce, reputation plays an important role. A good reputation supports our own recruitments, while also increasing the appreciation of the whole forest machine industry, which is facing its own challenges in attracting workforce. Reputation also contributes to the pride employees feel for their work.